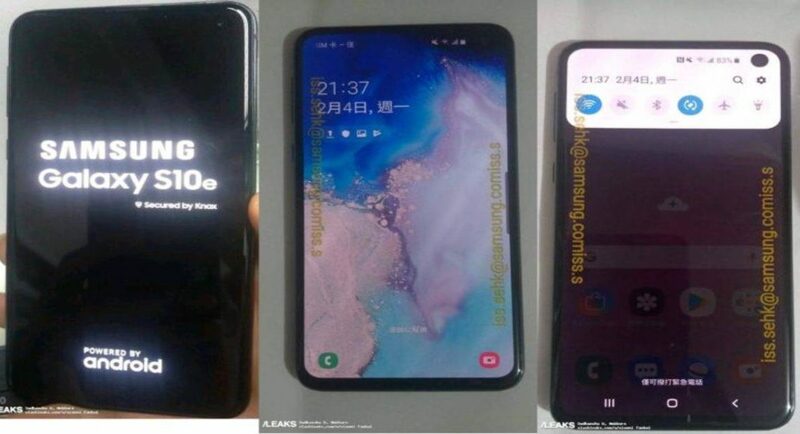 Finally, the leaked images of the Samsung Galaxy S10E have been publicised. Until now, we just had the leaked images of other Galaxy S10 models and now it is confirmed that there is indeed another version of S10 coming. From what we know through the leaks, the Samsung Galaxy S10E will sport a flat 5.8-inch Infinity-O display. There is a front camera cut-out that is 0.5mm in diameter, which is not very different from the Galaxy A8s. The leaks confirm that this phone will indeed be called the Samsung Galaxy S10E, for the name is displayed on the extreme left of the phone. The device will come with a 6GB RAM and 128GB internal storage. The Samsung Galaxy S10E is going to come in three colour options—black, green and white. The cost of the smartphone is going to be around $850 that is Rs 19,350. It will reportedly come with the same sensors as the other models of the Galaxy S10 series. So, considering that the Galaxy S10+ is powered by Exynos 9820 processor, the Galaxy S10E just might have the same one too. To talk about the Samsung Galaxy S10+, it will come with a 12GB RAM alongside a whooping 1TB storage. The smartphone will sport a 6.4-inch display and a dual front camera setup. The Samsung Galaxy S10, on the other hand, will sport a 6.1-inch display as well as a dual front camera setup. We have also come to know a few things about the Samsung Galaxy A50. And from what we know, it will feature a USB-Type C port and come with a 3.5mm headphone jack. The smartphone is said to be powered by an Exynos octa-core SoC paired with 4GB RAM as one of its variants. The 4GB RAM version is going to bring along internal storage of 64GB and 128GB. The Samsung Galaxy A50 is going to house a large battery of 4,000mAh. To talk about the Samsung Galaxy A10, it is going to run on Android 9.0 Pie and be powered by an octa-core Exynos processor. This, we have come to know from the Geekbench leak that was publicised recently.